Kids spend more years in their elementary schools than in any other school at one time, so graduating from 5th grade and moving on to middle school is a huge deal. Middle school will bring more independence, more expectations, and more responsibility for students, and less parental involvement in classroom activities. To mark this milestone for both students and their parents, here are some fun and memorable ways you can celebrate 5th grade graduation, either as a class or as a grade. If the weather is nice during the last week of school, why not have an outdoor party, like a picnic, to celebrate 5th grade graduation? Either have your class (or grade) picnic on school grounds, or go to a local park where there is space for kids to run around and play. Set up a food table or concession stands with standard picnic fare, like hot dogs, burgers, veggies, chips, salad, and bottled water or soda. Be sure to include a few carnival games (like ring toss, lawn bowling, milk can knock down, and even a duck pond, to keep kids entertained. To make it even more enjoyable, make your picnic a Family Day and invite parents, siblings, and grandparents to join in the fun. Make your 5th grade graduates feel like VIPS with a fun Movie Night event to celebrate their graduation. Either choose an evening and show a few movies, or make it an all night event where you show movies from dusk until dawn. 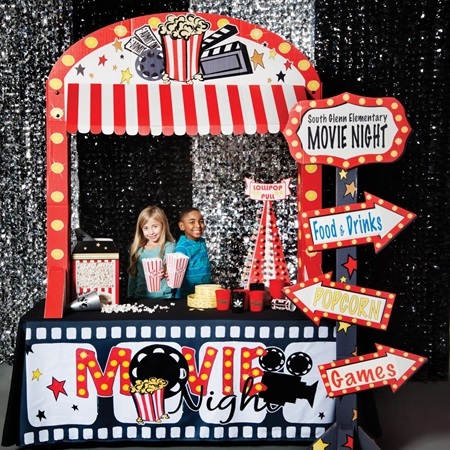 Set up a “movie theater” in your school auditorium, gym, or cafeteria, and show popular films kids love. Don’t forget to include a red carpet walkway, roped railings, a ticket booth and concession stands to add the perfect touches to your graduation Movie Night. Elementary school is a special and memorable time for your students, so be sure to mark the milestone of 5th grade graduation by giving your students a send off they will love and remember for a lifetime. Are you ready to celebrate 5th grade graduation at your school? We have everything you need.